Equipment from the University of Toronto’s Earth science laboratories has found a new home in South America thanks to a professional connection between faculty at U of T Mississauga and the University of Guyana. 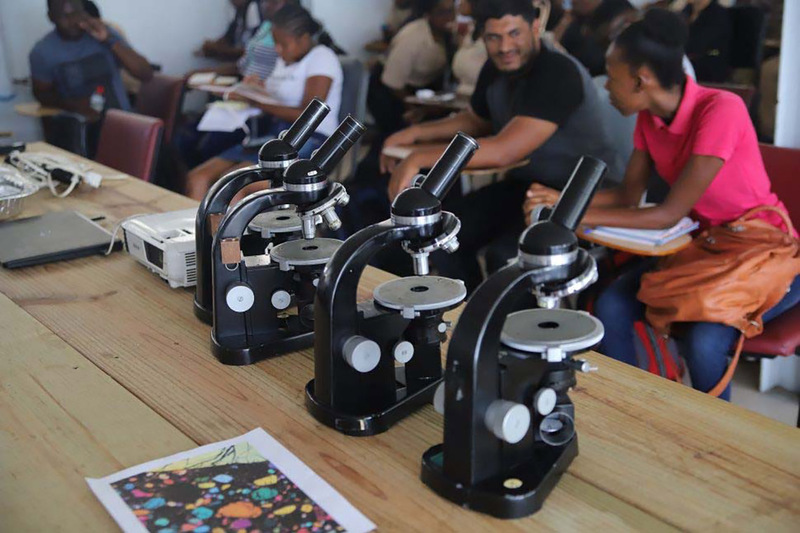 Dan Schulze, professor emeritus of the department of chemical and physical sciences at U of T Mississauga, presented 23 microscopes in March to the University of Guyana’s Faculty of Engineering and Technology for use by students in the petroleum and Earth sciences program. The equipment was originally purchased by U of T more than three decades ago. When U of T Mississauga upgraded its equipment, the microscopes were placed in storage. The connection between U of T Mississauga and the University of Guyana began when Professor Andrew Chater taught Schulze’s course while Schulze was on a research sabbatical. The two kept in touch over the years and in 2018, as Schulze was preparing to retire, Chater, who is now head of the petroleum and engineering department, invited Schulze to be a guest lecturer. Schulze remembered the disused microscopes and saw an opportunity to put the equipment to use again. U of T Mississauga lab co-ordinator Sheila Ballantyne refurbished the equipment, adding new electrical cords and bulbs, and Schulze accompanied the microscopes to Guyana with funding for shipping provided through a grant from the Guyana Geology and Mines Commission. He presented the equipment at a special event with students and dignitaries from the University of Guyana, including Vice-Chancellor Ivelaw Griffith, who thanked U of T for the donation, noting that the equipment would benefit more than 140 students of the petroleum, mining and engineering programs at the university. “Science can be done with basic instruments that may be outdated for us, but still hold high intrinsic value for science education,” says Professor Claudiu Gradinaru, chair of U of T Mississauga’s department of chemical and physical sciences.